The Microsoft inventory control spreadsheet provides business owners with a complete solution for the inventory problems of the past. 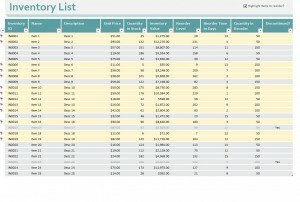 This incredible Microsoft inventory control spreadsheet is available for free to all visitors here at MyExcelTemplates.com. After downloading, you can clean up all your inventory issues with the inventory control spreadsheet. Once you have successfully downloaded the inventory control spreadsheet template from this page for free, open the spreadsheet in Microsoft Excel. Prior to filling in any data fields, save the template to your desktop, hard drive or any place that is easily accessible. While you’re always welcome to return to this page at any time and download another copy of the inventory control spreadsheet, it’s always good to have a blank copy of the document on here in case you need one on the fly. Once you’ve saved a blank copy, you’ll notice that there are several categories within the inventory control spreadsheet. The categories include things like inventory identification number, item name, item description, unit price, quantity in stock, etc. While advanced in layout and technology, the inventory control spreadsheet incorporates many of the same principles employed by traditional paper sheets. Information contained in the inventory control spreadsheet can be sorted in whichever manner will best meet your needs. In fact, you can customize any aspect of the template so that it better meets your purposes. With the inventory control spreadsheet from Microsoft, the customization possibilities are endless. Get the Microsoft Inventory Control Spreadsheet Free Today! The importance of keeping proper inventory records cannot be understated. Without the right numbers at your fingertips, you’re setting yourself and your company up for disaster. Get some peace of mind by downloading the Microsoft inventory control spreadsheet from MyExcelTemplates.com today. It’s just one of the hundreds of helpful templates available that are all designed to make life around the office a little bit easier.